PEIE Design, Engineering, Manufacture, Supply, Erection & commissioning 2nd generation Mud-gun machine in TPM methodology with following customer delighting features. We control cost by work hard. The intention of this supply is to achieve the minimum criteria for closing the tap-hole of Blast furnace after Hot metal/slag drain or draining condition. Design & Development of flow sheet & Selection of equipments. Manufacture, Shop test & Supply . Detailed Engineering with Civil Loading details. Supervision, Fabrication, Erection & Trial run of PEIE Supplied equipments. PEIE Mud-Gun consists of a Pedestal with a vertical column holding the swiveling Boom. The Boom swivels through a gear train operated by a Hydraulic Motor. Levers and other accessories. During closing, the Mud Gun is brought to tap hole, aligned and clamped by another Hydraulic Cylinder..
Then the mud pushed by actuating the pushing Cylinder. The Mud Gun assembled with Swivel Joint & Hose-less piping system. d) Servo system HLP-68, 800 Lt.
h) ESS Hyd / Hydrocraft. i) ESS Hyd / eqvl. d) Steel casing / s.s.
PEIE Design, Engineering, Manufacture, Supply, Erection & commissioning 2nd generation Tap hole Drill machine in TPM methodology with following customer delighting features. We control cost by work hard. 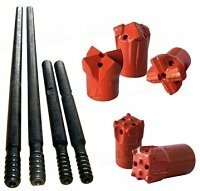 The intention of this supply is to achieve the minimum criteria for Opening the tap-hole of Blast furnace by drilling to drain Hot metal/slag or partial draining condition (Upto 65 mm dia (For 265m3 MBF). Feed tool made from M.S. seamless tube with hardened tip Drill bit. PEIE Tap hole Drilling machine consists of a Rigid base frame with a vertical central shaft holding the swiveling body boom. 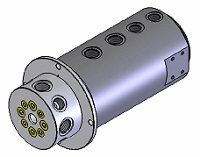 The Body Boom swivels through a central bearing operated by a Hydraulic Cylinder. Levers and other accessories. During opening, the Drill Machine is brought to tap hole, aligned and clamped by same Hydraulic Cylinder.. The Drill Machine is assembled with a Swivel hose header and fixed piping system. Arrangement drawings to be enclosed. The Drill Machine is operated with Levers and other accessories from a Operators’ Stations located beside Mudgun operating station.